As the weather starts to warm up I wake up now and again at night, soon after the sun goes down. I go out for a little nibble if there are insects flying. I notice that the buds are starting to open on the trees and I’m looking forward to summer. Wow! I’m really starting to get my energy back. Each evening it gets a little warmer and I stay out feeding a little bit longer. More of my friends are out flying at dusk every evening too. It’s great to see them all after the long winter. In May I meet up with lots of friends and family – I have lots of cousins! Together we form a colony. We find a nice comfortable warm place to hang out in. We don’t need a nest like birds. And yes! We love hanging upside down. I don’t know how you humans can walk around on your feet! Doesn’t all the blood go down into your toes? I am going to have a baby in a few weeks’ time and I’m really excited. And guess what? My great grandmother is going to have a baby too! 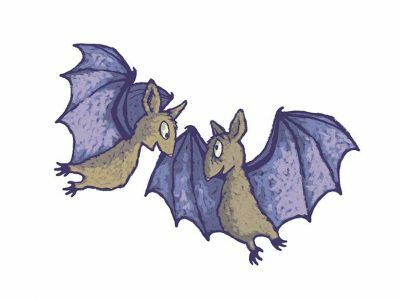 Bats can live for many years, which is unusual for small animals. 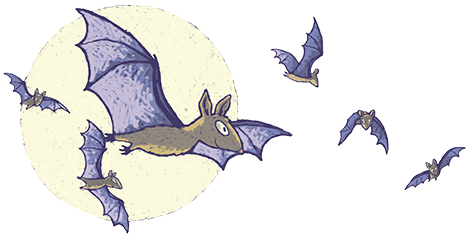 That’s another reason why bats are special. In some roosts you might even find great-great-great-great-great grandmothers alive at the same time as their great-great-great-great-great grandchildren! We really like sleeping in attics during the day but sometimes we go to our favourite tree crevice and sometimes we live in a crack under a bridge over the river. It is handy being near the river or beside the woods because there are always loads of insects to eat every night over water or around trees. Hedgerows are great for insects too! We usually come out after the sun has gone down because we like darkness best. We can see pretty well, but we usually use sound to find our way around in the dark and to catch insects. We make high pitched squeaks and then listen for the echoes to come back. The word for this is ECHOLOCATION, ask your Mum, Dad or Teacher if you need help sounding this out.